Plain magnetic tape - depending on your application you may need to add your own specialist adhesive onto the non magnetic side. Or you can screw directly through the materials to fix it into place! Cuts easily with normal scissors. A multitude of uses - and if you need an adhesive on the non magnetic side then take a look at the premium or economy versions. Or if you intend doing secondary double glazing then look at the whiute foam versions. 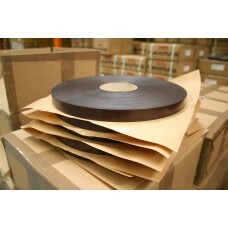 19mm White Foam Adhesive Tape 1 roll = 30 metres (Total thickness is 2.5mm) ..